I was doing a bit of research on airbases in England during the war, and more specifically, airbases used by U.S. bomber squadrons in Lincolnshire, England during 1944. This is the time frame from which the baseball bat was created and I wanted to neck down the options on what aircrews might have participated in that area during that time. Well....there are literally dozens of of airbases that could have been the source of the story and many scores of U.S. squadrons. Therefore, since I knew that the squadrons were part of the Eighth Army Air Corps, I decided to research the history of the U.S. Eighth Air Force. I was able to find the home of the National Museum of the Mighty Eighth Air Force. 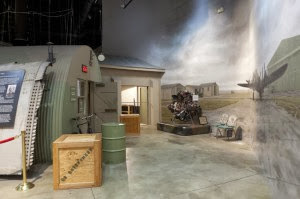 The museum is located in Pooler, Georgia just outside of Savannah. I contacted their public relations director and offered to donate the bat to the museum in order to...maybe...just maybe...make contact with one of the original users of the bat. Maybe some GI remembers this story and can have a moment of enjoyment remembering those days with comrades and the American pastime...in a distant country. The person I contacted was gracious and excited about receiving the bat. 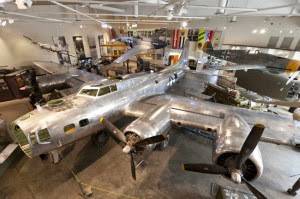 I decided that I would bring it with me in the near future, on a trip I plan to make to visit this impressive museum. When I make the trip, I will record my observations and take pictures for you guys!